Save SAR 105 (30.09%) – Earn 23 Shukrans What is Shukran? Shukran is the Landmark Group’s award-winning loyalty programme in the Middle East, which allows you to earn Shukrans when you shop any of our brands. A fine addition to your bedroom collection is this beautifully printed comforter set. 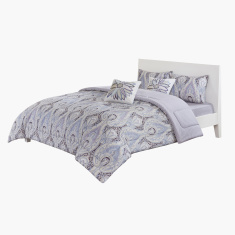 The alluring print and the soft feel of this comforter set make it a must-have.